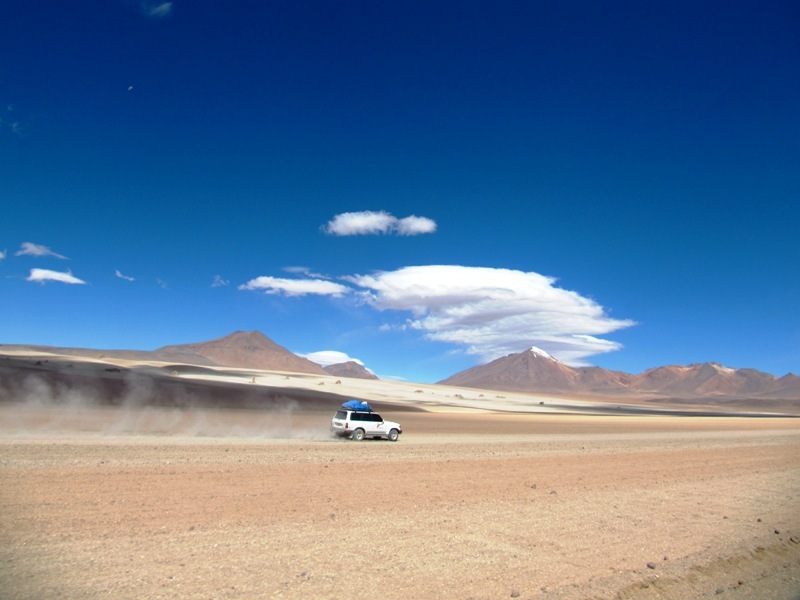 I didn’t really know what the 4 day Salar de Uyuni tour really entailed but I was looking forward to it nonetheless. 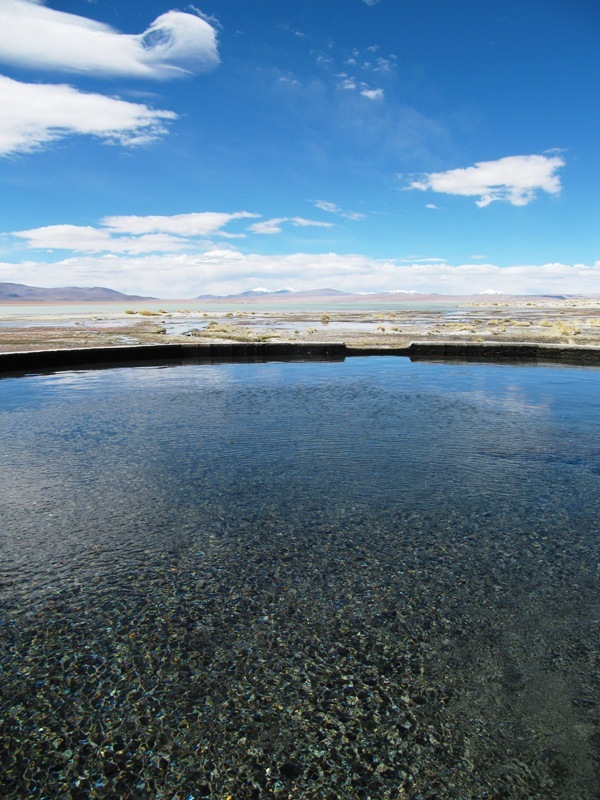 I had seen a picture of one of the tour sights – the salar (salt flats) that looks like you are sourrounded by endless snow but it is actually salt. This was enough for me to build it into our itinerary. Fortunately, Nathan trusted my gut on this one. 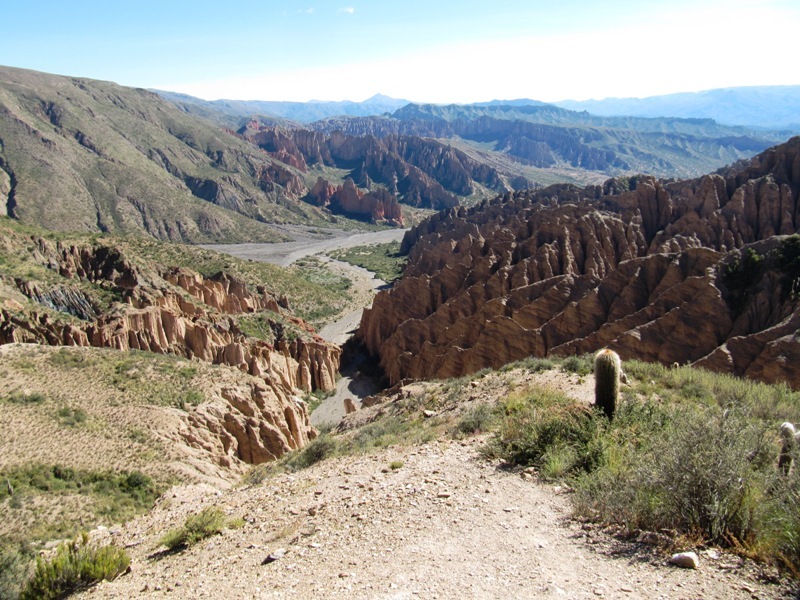 As we got closer to Bolivia we met more and more travellers who had positive experiences. A range of superlatives were used to describe the scenery: “beautiful”, “spectacular”, “surreal”, “the best”. So we hopped in a jeep with Mark and Sally, the English couple we had met in Cafayate, and were on our way. An our outside of Tupiza and we already had our first breath-taking view. 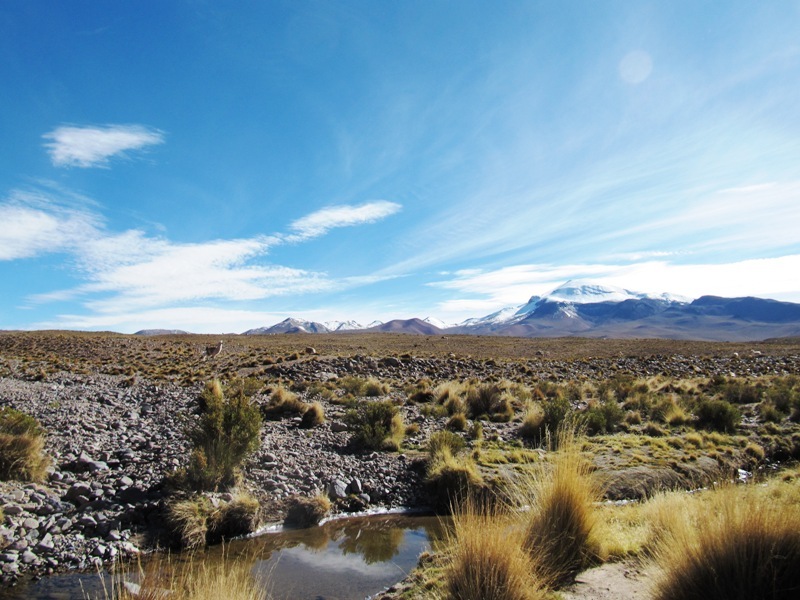 Onwards we climbed up to the altiplano (high plateau). Our excellent driver, Idel, was happy to inform us about the flora and the fauna. 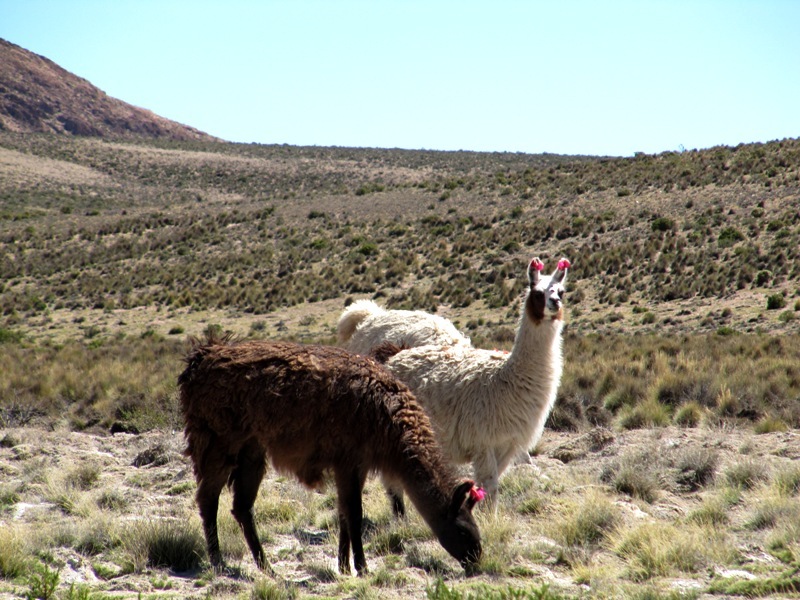 The flora mainly consists of sturdy clumps of grass which were fed on by the llamas and the vicuñas. The llamas were adorable all dressed up with colourful ribbons in their ears. This was how the owners identified their herds. 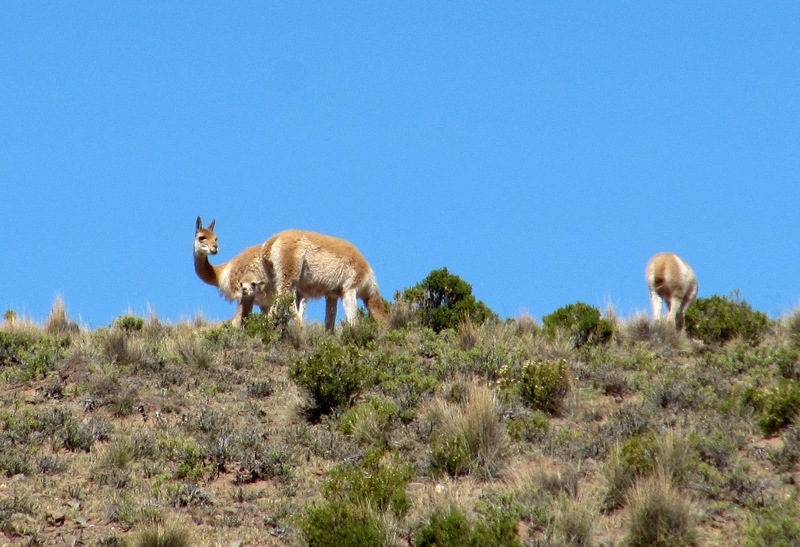 The vicuñas, on the other hand, are smaller and wild. They are a protected species so they don’t have ownsers. But once a year the local community rounds them up to shear their extremely valuable wool. The $400 a pound profits are shared collectively. Tiny settlements dot the mountain landscape. They are hard to spot as the mud brick homes blend in with the earth. 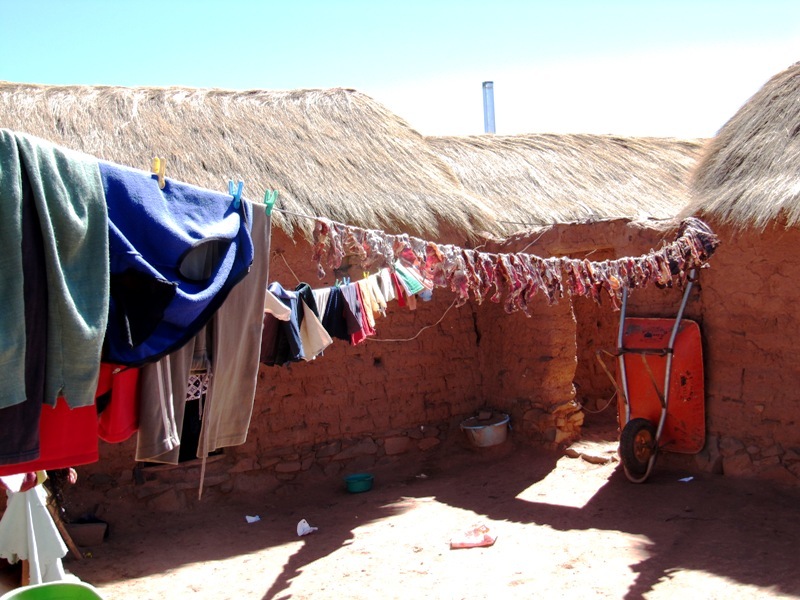 We stopped in one and saw how their clotheslines were multi-purpose. The next town over we spend the night, surrounded by dramatic mountain scenery. The stars were beatuficul but it was too cold to observe for long. Instead we retreated to our own beds which had 3 heavy blankets on them. The next morning we travelled a short distance to a set of Spanish ruins. 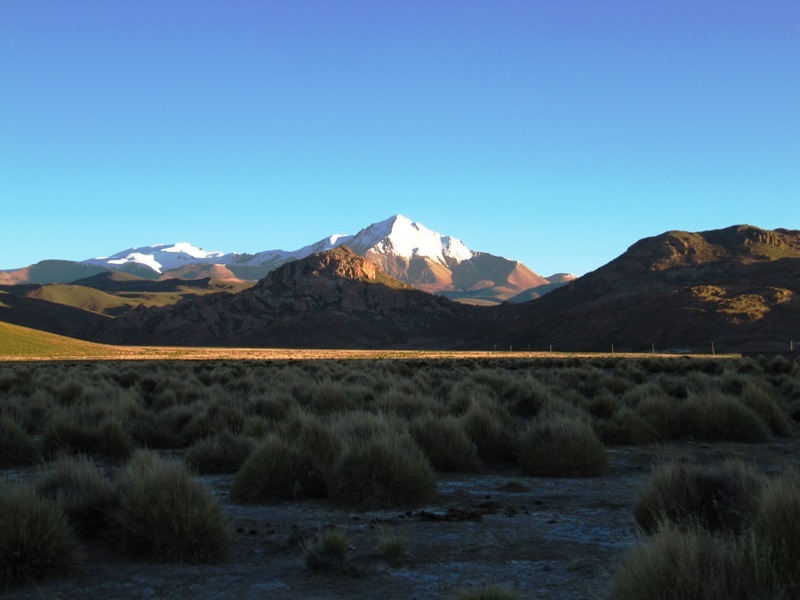 The Spanish had settled there in the 16th century because of a nearby silver mine. They essentially enslaved thousands of indigenous people to work there. The town had a reputation for having too much money, making people greedy and wasteful. When an epidemic decimated the population, the town never recovered. With the silver dried up and the buildings in decay, the last residents left 20 years ago. Now, the crumbled homes are inhabited by cute, rabbit like animals called viscasha. 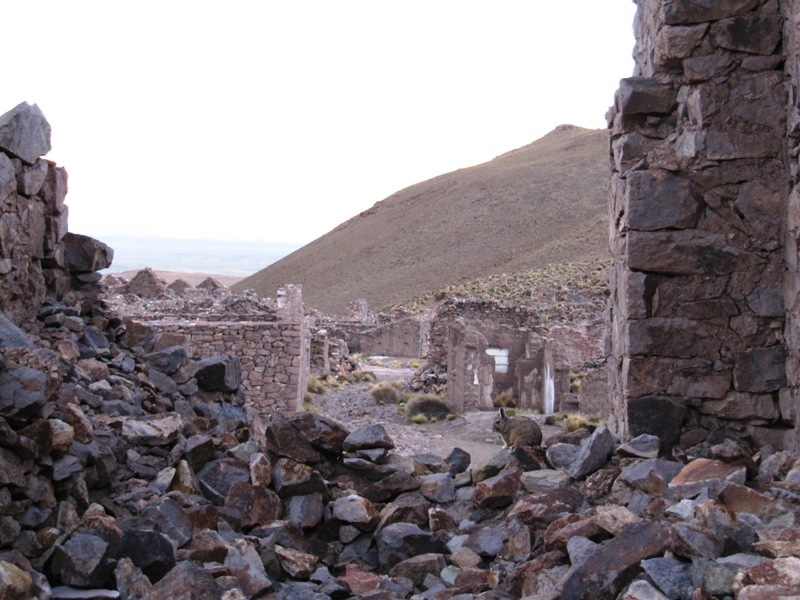 The ruins were followed, of course, by more drastic scenery and more llamas! And then a new animal entered the scene – flamingos. I had always thought of these pink and black birds balanced upon spindly legs as a Caribbean creature. 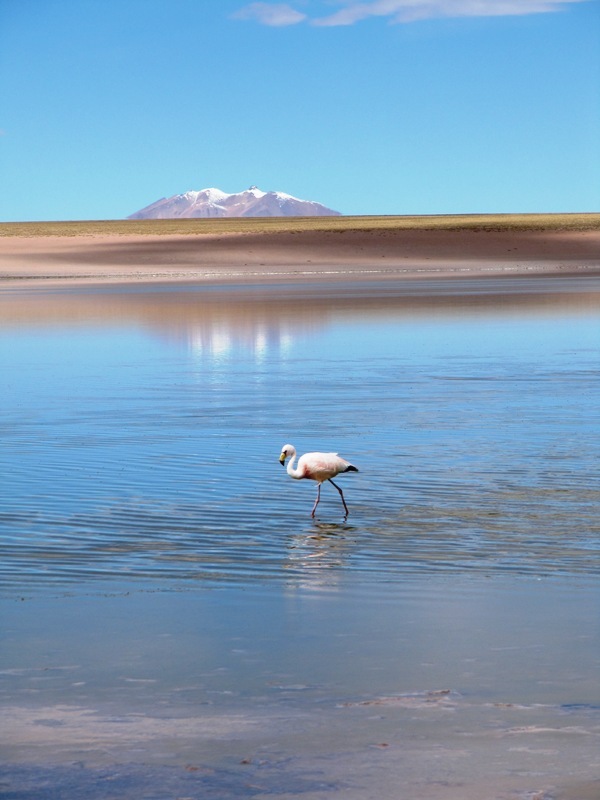 But these flamingos like it rough, toughing out the cold and wind of the Bolivian highlands above 12,000ft. I don’t like it so rough. At the next stop Nathan and I took a dip in the soothing natural thermal pool. It was the perfect temperature and had perfect views to boot. All warm and toasty from our bath we headed into a dining hall for a delicious beef stew lunch. I haven’t mentioned yet but there was another jeep in our group. That made 8 of us total. It was quite an international crowd: 2 Americans (us), 2 Brits (Mark and Sally), 3 Italians (Matteo, M, S) and 1 Pole (Gossia). 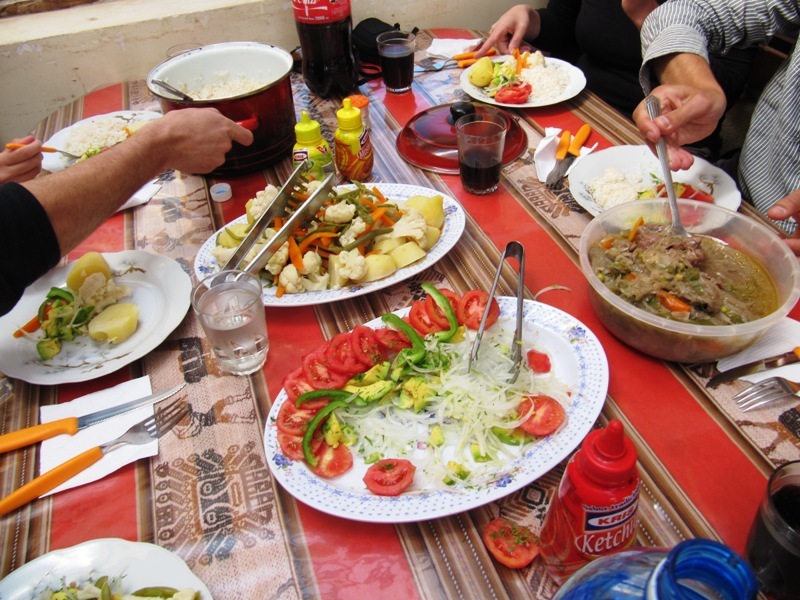 It made all our meals very convivial. But there was yet more to see. We drove through the Dalí Desert named for the surrealist painter. I’d say it was an apt reference, especially with the brushstroke clouds painted in the sky. 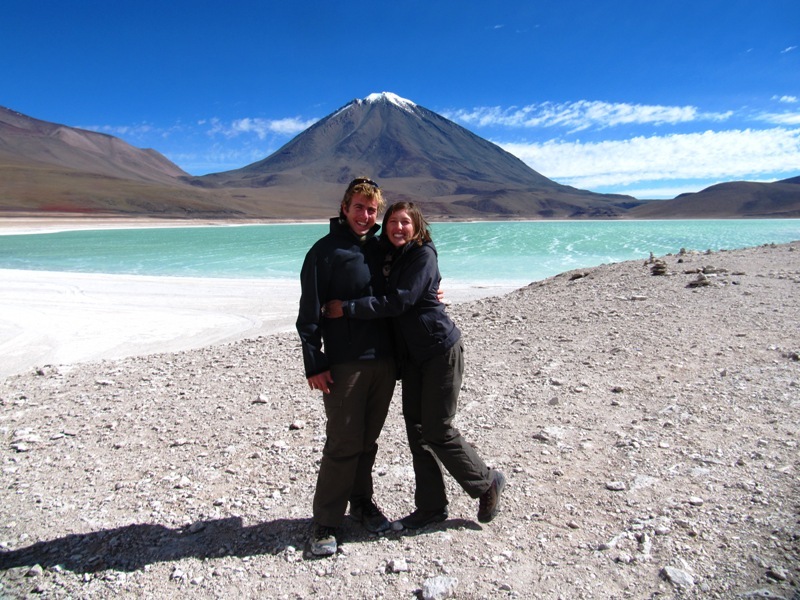 Then we hit the Laguna Verde, named for the green color produced by minerals such as arsenic. 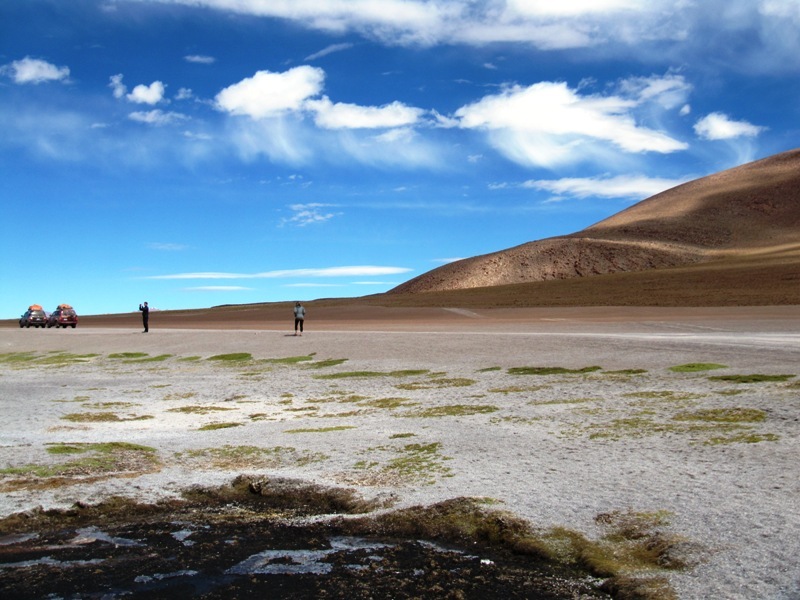 Finally, we made it to the geothermic area called Sol de Mañana. 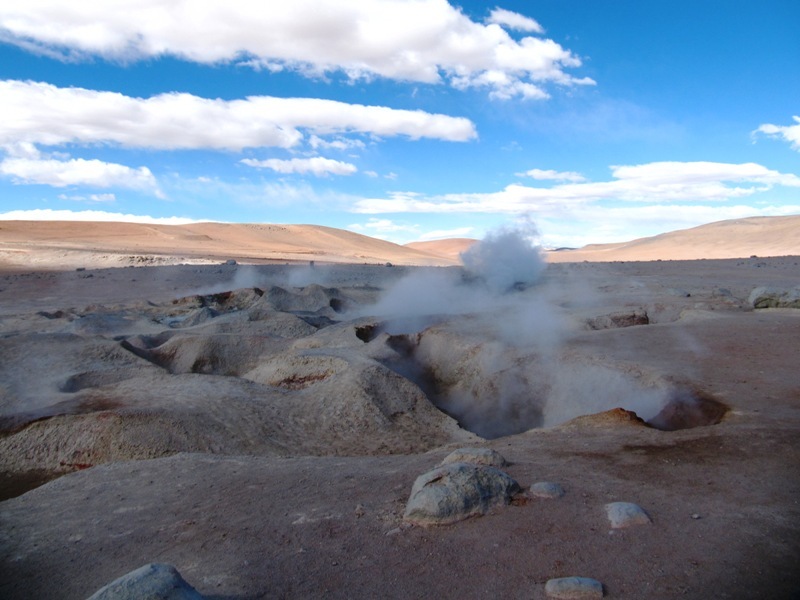 Here the heat of the earth escaped through bubbling mud pools and steaming geysers. One steam spout was so powerful it almost seemed to whistle like a kettle on the stove. It was a long and happy couple of days, and the tour was only half over! Oh Manish. We love all your comments!! Thank you for making us smile and laugh. We miss you.